There’s a new water sport in town that will literally blow you out of the water. Jack Fisher only wanted to check out the latest trend when his girlfriend took him to Destin to try Flyboarding. He got more than he bargained for when he landed a board, a balance … and a business. After a 15-minute flight, Fisher was sold. He told his girlfriend he had to have one. While paying for the service, she asked to add on the equipment. Several thousand dollars later, the pair went home with their shiny new toy. 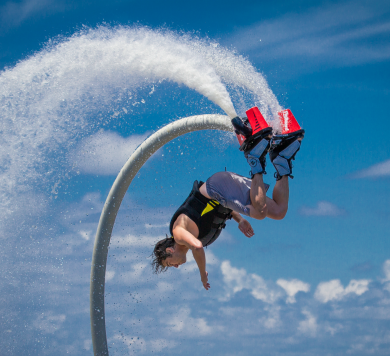 Since launching the business in 2014, the entrepreneur has been met with major challenges – mainly, educating the people on what Flyboarding is and how much fun you can have. A Flyboard is a foot-mounted board connected by a 60 ft. hose to a wave runner. The output, which would typically propel the watercraft, is redirected to two jets on the bottom of the board, creating exceptional lift. At FlyBoard BAMA, a trained operator controls the wave runner’s throttle, so all you have to do is fly. When you arrive at the FlyBoard BAMA location on the Back Bay, you’ll be guided through a 7 to 8-minute tutorial before you hit the water. The professional staff will explain what to do, and even teach you some hand signals that will help them customize your flight. If you can’t, you don’t pay. That’s Fisher’s promise to his customer. As an exercise in advertising, he had his guys fly down the beach and got 79 phone calls in one day. If you’re among the curious, check out the FlyBoard BAMA website for amazing video footage before you book. Now entering its first summer, we’re confident the new business – just like its soaring clientele – will take off. FlyBoard BAMA is located at 26189 Canal Road in Orange Beach. For more information, call (855) 524-8837.